Over the last 20 years I have become a very avid and passionate backpack style of hunter—specifically for Rocky Mountain Elk. For the past 7 years I’ve been applying for these types of hunts all across the western states. 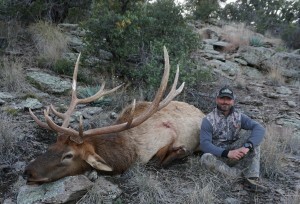 Early in 2015 I got a call from the Arizona Fish and Game Department (the call every hunter dreams of) letting me know that I had drawn one of the two non-resident late rifle bull elk permits in a top Arizona unit. Planning began right away. I first purchased several maps of the region and then contacted Huntin’ Fool Magazine to get a list of its members that had been drawn in the same unit. I then contacted previous tag holders to gather as much information as possible about the area. Through those phone calls and the generous help of Huntin’ Fool members, I learned that my unit consisted of all types of terrain; from very rough ATV roads, to rolling grasslands on the desert floor, to cactus covered mountains that rose up to 6000 feet—exactly the kind of country I live for. Once I felt familiar with the terrain I spent the remaining months training physically and spending as much time as possible behind my PROOF Research Tac II 300 Win Mag. One thing was certain, if anything can be in elk hunting, I would well-prepared and ready for the shot of a lifetime if it presented itself. On November 20th with my truck was loaded down with 16 days’ worth of supplies I was ready for the 22-hour road trip into country that I had never laid eyes on before. After arriving with a few hours of daylight to spare I unloaded the ATV and began exploring this rough, but beautiful country. The next morning I was up early and with the ATV packed with 5 days of gear, again set off into the backcountry. As the sun was rising I parked the ATV, threw on my pack and made my way into the deep Arizona backcountry for the first time. I’d only ventured 30 minutes from the trailhead when I spotted a mature 6X6 bull elk and knew that this was going to be a great hunting adventure. 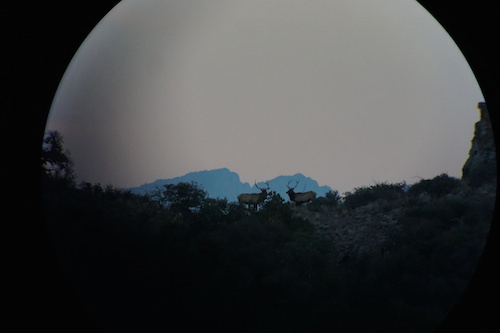 Arizona’s rugged, but breathtaking wilderness, challenged me both physically and mentally, but after 6 days of scouting I’d spotted over 30 different bulls and determined the bull I had my eyes on. Early in the morning of opening day I watched him bed down on a far hillside. I watched him for several hours until late afternoon when he finally rose out of his bed to feed and presented me with a shot at 611 yards. With my Leupold Mark 6 scope dialed to 18X power, I made two shots with my PROOF rifle and the bull dropped to the ground. 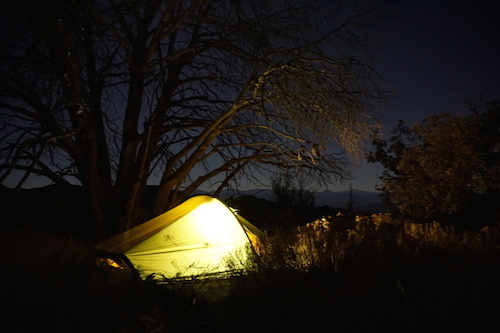 After preparing the animal for the pack out, I made the hour journey under a full moon back to camp. Waking up the next morning to ten degrees and blue skies we loaded up camp and the antlers and made our two and a half hour cross country trek back to the ATV. After 3 trips, 16 miles, 11 hours of packing meat and 3 hours on the ATV, the job was finally done. 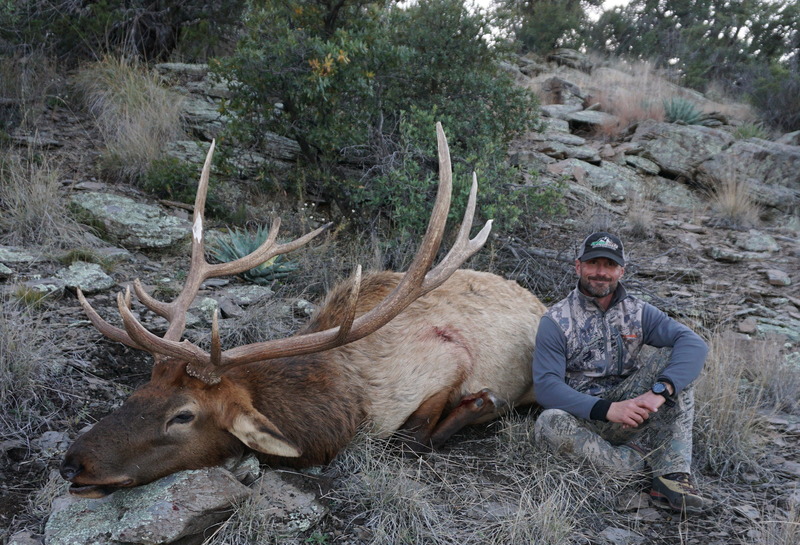 This 9-day and 65-mile backpack adventure in Arizona’s vast wilderness will always be one of my best hunting memories that I will cherish throughout my lifetime. I would like to thank my beautiful and very supportive girlfriend, Kali Guess, for understanding and encouraging my passion and for being able to be there with me for a few days during the actual hunt. I’m glad she was able to experience what these crazy adventures are all about. Also, a huge thanks to PROOF Research for giving me this amazing opportunity to be a part of their team.